Dog obesity is a huge problem across the Globe. In North America alone, a 2017 report from The Association for Pet Obesity Prevention (APOP) estimated that 56% of dogs are obese. This is truly shocking and many owners do not even realise that their dog is too fat and that they are doing their pet a disservice. It is really important for your dog’s health and mental well-being to keep them at a sensible weight level. For more detailed guidance see our in-depth article on managing a dog obesity problem. If you do have your dog on a diet but you want or need to continue with training, it can be tricky if you are using food rewards. Also, if you have been used to giving them lots of chews in between their meals it can be tough when you see them looking at you expecting something extra. Don’t despair though, there are lots of strategies that you can employ to ensure that you can still successfully reward your dog for good behaviour, keep them mentally stimulated and there are plenty low-calorie treat options out there too. So, first of all, if you have a dog that is morbidly obese and really needs to lose a drastic amount of weight, they will likely be put on a VERY strictly controlled diet and exercise regime. It may be that, at first, they should really only be having strictly controlled portions of a designated diet and the vet may not want you to introduce any other foods into their diet. You don’t want to be messing up with their weight loss when it could be causing serious health and possibly even behavioural issues. Make sure you always work closely with your vet and possibly even a canine nutritionist and talk with them about what, when and how much additional foods you can be introducing to your dog’s diet on top of their already agreed upon meals. So, sometimes, when your dog is on a strict weight loss programme and providing they are foody enough (if they like their grub, they likely will be), you can just use some of their daily food portions for rewards when training. It may be more challenging if you are working on a new, more challenging behaviour or in a more distracting or different environment. Being realistic though, some dogs will just not work for ‘boring’ kibble and need something more high value. If your dog has been used to getting lots of extra chews or if they need things to help them settle when you are out or you just want to “trick” them into thinking they are getting more food by making mealtimes last longer, then having a good selection of tough treat toys could be a really worthwhile investment. You can stuff the treat toys with their meals (often you have to soak it to make them fill the toy out and make it more challenging). You could even add a low fat, non-salty broth or stock for soaking the food in to make it even more enticing. Freezing it first can make it less messy and more of a challenge for your dog to get the food out. Our favourite treat toys are the Classic Kong Toy and the West Paw Design Tux but there are lots of different options and every dog will have a preference. For a list of other suggestion see our article on great interactive dog toys. Whilst these sort of toys can be an initial expense, it can work out a lot cheaper than standard chews in the long run and it is often a much healthier, stimulating, safer and long-lasting option. Whilst some people may think that it is okay to just regularly cut back their dog’s food portion to make way for more treats, it is important to remember that their meals are what is going to give them the right balance of nutrients, vitamins and minerals to help give them a healthy and balanced diet. If you substitute too much of their food out in place of treats then you risk them not getting this balance. This is relevant anytime but it is especially important with dieting dogs. If they are on a special calorie controlled diet and you are swapping out too much of it to make way for treats you could be risking their health and getting in the way of their weight loss schedule. Even if you are using treats suitable for a weight loss programme, make sure that, as a general rule, they only make up around 10% of your dog’s daily diet. Obviously, this is just a guide and it doesn’t have to be super prescriptive all the time but often people may be cutting back the normal dog food radically or giving so many treats on top of the normal meals without thinking about the impact this will be having on the dog’s waistline. Sometimes you may have a great treat option for a dieting dog amongst the items that you already have in your cupboard. If your dog likes to chew on something then why not try giving them a carrot. It may not be for every dog but a lot of dogs enjoy it and it is a much healthier (and often safer in terms of the potential blockage or tooth breaking risk) option than many traditional dog chews. Don’t forget though not all foods that are healthy for us are good for our dogs. Most people will be aware that grapes and onions are not good for dogs but did you know that corn on the cob can present a serious choking risk, avocado can cause stomach upsets, and anything with the artificial sweetener Xylitol (often used in weight loss products) is extremely toxic to dogs. If you have a dehydrator then you could make some other great chew options that will put less strain on your dog’s waistline. Dehydrated sweet potato is a very popular option in terms of being good for dog’s on a diet, easy to get hold of, inexpensive and it works really well being dehydrated. Pumpkin can also work well and this is a good natural source of fibre which can help firm up loose stools. A dehydrator can also be great for drying out lean meat like turkey or chicken or pieces of fish and these can then be chopped up very small for use as training treats. While it can take the best part of a day to have the treats ready, with a little advance planning, you can stock up on yummy and healthy goodies for your dog and they can work out a lot cheaper than some of the top quality similar store products. The Presto 06300 Dehydro Electric Food Dehydrator is a well-reviewed model that is very reasonably priced and could be a good starter option to see how you, and your dog, enjoy the process. It has four trays as part of the package but additional trays can be purchased to fit a maximum of eight trays should you want to try to squeeze more treats out of every dehydration session. When looking for suitable dog treats to purchase for your dieting dog, don’t forget that low fat and low calorie are two different things. Often when people read that a treat is low-fat they assume that this will mean they are a great option for a dieting dog but, just because a treat is marketed as low-fat, it does not necessarily mean that this will help with weight loss. It could be loaded with sugar-filled carbohydrates and potentially lots of calories. Low-fat treats are often more important if you have a dog with a medical condition that means that they need something that is easier to be broken down during digestion. Dogs that suffer from pancreatitis, for example, may not be overweight but they still need to be on a low-fat diet to help them minimise the risk of suffering from a pancreatitis attack. Low-calorie treats are usually more specifically designed to help manage a dog’s weight. Weight loss boils down to calorie intake (along with an appropriate exercise regime), so the fewer calories that you have the more weight you are likely to lose. By selecting low calorie treats and managing the amount that you give this can really help your dog shed those pounds. There are some low-calorie treat options for dogs that have better quality ingredients than others. We have suggested five popular, healthy, low calorie treats that are small and tasty and work well for dieting dogs that are still getting food rewards when training. Don’t forget though that every dog is different with what works best for their digestion and what they will enjoy the taste of most. Always introduce any new foods gradually to minimise the risk of stomach upsets. 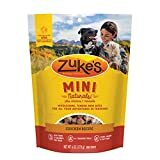 Zuke’s Mini Naturals Dog Treats are a very popular training treat option. They are small in size and only have 3 calories per treat. They are made in the US, have high-quality ingredients, are available in a variety of flavours and are popular as a high-value treat option as most dogs seem to love them and work well for them. Their size means you don’t have to bother with breaking them down any further but you can chop them up if you want to spin them out further (some people make 4 totty treats from one small original one). They are strong smelling but this helps to make them even more appealing to the dogs. They also hold their shape well and don’t tend to go all smooshy when inside a training pouch. The treats come in a variety of bag sizes too (with a handy seal) so if you want to stock up on a favourite treat and save a little money by bulk buying you can. 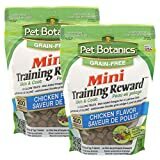 Pet Botanics Training Reward are only one and a half calories per treat so they are another really good option for dieting dogs. They are again small, semi-moist (without crumbling), made in the US, have a variety of flavours and, again, do well in the palatability test. They do also come in bigger size treat options too so make sure you select the mini version if you want to give frequent and small rewards. Popcorn is another popular low-calorie treat for dogs (providing they don’t have an intolerance to corn). It is not the most nutritious of snacks but it is great for those watching their waistline. The Pupcorn brand has a lot of different flavours and tub sizes and these treats have a crunchier texture than the Zukes or Pet Botanics ones. These are another popular semi-moist and very palatable low-fat and low-calorie treat option. They are not as low in calories as the Pet Botanics ones, for example, but they are still only 7 calories per treat. There have been some customers that have complained about quality control issues though with some bags having treats that are dried out so they lose their intense palatability and become very crumbly and messy too. 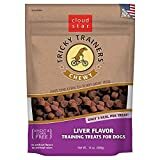 The Cloud Star Tricky Trainers Chewy Grain Free Treats are another popular low-fat and low-calorie training treat option. They only have 3 calories per treat. They are made with good quality ingredients, they are semi-moist and can even be cut up to make super tiny morsels if you want to spin them out further. They are well reviewed in terms of the palatability test with a lot of dogs. They have a slightly chewy texture and this can be useful if you want your dog to chow down a bit more, perhaps if you are working on distraction training sessions. My Dog Almost Got Killed By A Moose. Here’s What You Need to Know.